"You Sabe Him? Kealney Must Go!" 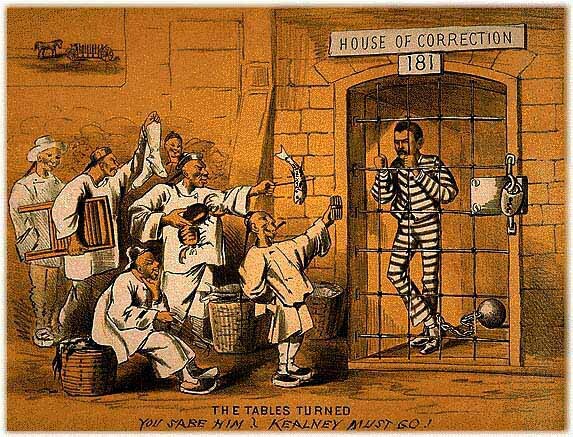 Denis Kearney wears a prison uniform in this lithograph called, "The Tables Turned : You Sabe Him? Kealney Must Go!" It was published by San Francisco book producer Isadore Nathan Choynski, and dates from late 1877 or early 1878, when Kearney had been jailed for inciting a riot. The San Francisco Board of Supervisors had passed an emergency ordinance banning incendiary speech following some of Kearney's fiery speeches. On October 29, 1877, a sensational meeting was held on Nob Hill, as the highest point of California Street hill is called. This magnificent view-point had been chosen by the railroad magnates as a home site. There Leland Stanford, Charles Crocker, and Mark Hopkins, three of the builders, had erected large and luxurious residences. Another handsome house was that of General D. D. Colton, a high railroad official; after his death his house was purchased by C. P. Huntington, another one of the Big Four. Some time after, A. N. Towne, another high official, built a house across the street from Colton's. About sixty feet of the crest of Nob Hill had been cut off, and a plateau leveled for buildings. There was much open ground, and Kearney determined to call a night meeting on Nob Hill instead of at the Sand Lot. There, in the midst of the millionaires' palaces, he advised his followers to defy the rich. Several thousand responded to his call. From an improvised platform, with great bonfires blazing and lighting up the dark, the agitator thundered forth his philippics against the rich. It was here that he threatened to "lynch railroad magnates, thieving millionaires, and scoundrelly officials." He declared that stenographers were among his hearers, surreptitiously taking notes preparatory to indicting him. He defied the Grand Jury to indict him, and threatened that if he were jailed his followers would "destroy all the rich hell-hounds in California." This Nob Hill speech and his preceding utterances caused such disquiet that on November 3, 1877, at a meeting in Kearny Street he was arrested and jailed by the police for incendiary language and inciting to riot. At a meeting the following day, November 4, two other Workingmen's agitators, H. L. Knight and J. G. Day, were also arrested and jailed. The San Francisco supervisors met and passed an ordinance against incendiary speech, entitled after its author "The Gibbs gag law." Kearney protested to the Mayor that he had been incorrectly reported in the newspapers, and promised to mend his ways. Thereupon the charge against him was dismissed, and he and the other two agitators, after a fortnight's imprisonment, were freed. Kearney's imprisonment had excited sympathy among the Workingmen, and on Thanksgiving Day a procession in his honor marched through the city, terminating at the Sand Lot, where speeches of the same threatening character were delivered; this parade numbered some seven thousand.